The Best French Onion Soup. 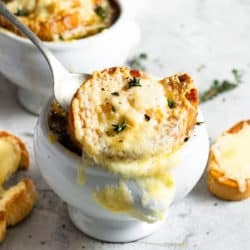 The most delicious and flavor packed french onion soup that’s super easy to make and topped with a slice of baguette and gruyere cheese for dunking. Simple and easy comfort food perfect for chilly days. Early on in marriage I learned that French Onion Soup was my husband’s favorite. I grew to like it too and, before long, restaurants were ranked according to their French Onion Soup. But, as a new wife and a foodie with a fierce competitive spirit, I decided to develop my own version of French Onion Soup, and I was quietly determined to make mine the best my husband had ever had. I started with a recipe that sounded promising, then added garlic, shallots, and a few other personal touches – it was an instant hit! I’ve been making this soup for years now and my husband still raves about it every time! When I serve it to guests, they almost invariably ask for the recipe. So I figured, why not share it with you too? As with most good soups, this one takes a little time to prepare, but it’s so worth it. I usually serve it as a main dish with a big green salad, but it makes a pretty impressive first course too. If you’re entertaining guests, this soup pairs well with my Rosemary and Bacon Wrapped Pork Loin or my Lemon Herb Roasted Chicken with White Wine. Stock vs. broth: I use a 50/50 blend of beef stock and beef bone broth – I love the rich flavor of meat stock, but also like the nutritional benefits of the bone broth. Chicken stock/broth could be substituted for a lighter flavor. Oven safe bowls: Last year I finally bought oven safe bowls similar to these. If you don’t have oven safe bowls, see below. How to make cheese toasts in the oven: If you don’t have oven safe bowls, just sprinkle the cheese blend generously over the bread slices you toasted in the oven. Heat the cheese toasts at 350 degrees for 3-4 minutes or until cheese is mostly melted, then broil for 1-2 minutes until the cheese begins to brown. This recipe is even better on the second day – just reheat the soup on the stove and follow instructions for preparing the toast and broiled cheese topping. The onions: I love using a mix of shallots and onions because shallots give a nice sweetness to the soup but you can use only onions if you don’t have them. Herbs: Make sure to use fresh thyme and not dried, it makes a huge difference to the flavor of the soup. Cheese: Gruyere is what’s commonly used to make french onion soup, it’s a perfect melting cheese and doesn’t lose flavor as it melts. Comte or fontina cheese would be great substitutes. Take your time: Allow time for the onions to caramelize and don’t be tempted to turn the heat up to speed up the process, the onion will just burn and the soup will become bitter. If you take time to caramelize the onions the end result is incredible and you’ll have the most delicious tasting soup! The best French Onion and Shallot Soup ever – this simple meatless recipe gets rave reviews every time! Melt butter in a large pot over medium high heat. Add onions, shallot, garlic, bay leaves, sea salt, and black pepper and cook, stirring frequently, until onions and shallots are translucent. Turn heat down to medium low and continue to cook, stirring occasionally, until onions and shallots are a deep golden brown (approx 20 min). Stir in flour and cook for 1 minute before adding wine. Stir well and cook 2 more minutes. Add stock/broth and thyme. Simmer uncovered for about 30 minutes, stirring occasionally. Once soup is ready, preheat broiler. Ladle soup into oven safe ramekins* (leave 1/4-1/2" at the top). Add 1 slice toasted bread to each, then top with sliced of Gruyere and a sprinkle of Parmigiano-Reggiano. Place ramekins on a rimmed baking sheet and broil for a few minutes, until cheese is melted and bubbly. Serve immediately, topped with a crack of black pepper and fresh thyme leaves. Extra stores well in the fridge and tastes even better the second day! Stock vs. broth: I use a 50/50 blend of beef stock and beef bone broth - I love the rich flavor of meat stock, but also like the nutritional benefits of the bone broth. Chicken stock/broth could be substituted for a lighter flavor. Oven safe bowls: Last year I finally bought oven safe bowls similar to these (on sale at the time of publishing this!). If you don't have oven safe bowls, see the Notes section of the recipe for instructions on how to get the broiled cheese topping on a baking sheet. How to make cheese toasts in the oven: If you don't have oven safe bowls, just sprinkle the cheese blend generously over the bread slices you toasted in the oven. Heat the cheese toasts at 350 degrees for 3-4 minutes or until cheese is mostly melted, then broil for 1-2 minutes until the cheese begins to brown. This recipe is even better on the second day - just reheat the soup on the stove and follow instructions for preparing the toast and broiled cheese topping. The onions: I love using a mix of shallots and onions because shallots give a nice sweetness to the soup but you can use only onions if you don't have them. Cheese: Gruyere is what's commonly used to make french onion soup, it's a perfect melting cheese and doesn't lose flavor as it melts. Comte or fontina cheese would be great substitutes. Take your time: Allow time for the onions to caramelize and don't be tempted to turn the heat up to speed up the process, the onion will just burn and the soup will become bitter. If you take time to caramelize the onions the end result is incredible and you'll have the most delicious tasting soup! This sounds delicious. My dad loved french onion soup. Oh my gosh that cheese!!! This sounds delicious!!! That cheese on top … swoon! YUM! I’ve always loved French onion soup. My mother used to make it and it was always a treat. This recipe looks more sophisticated than hers but worth it! 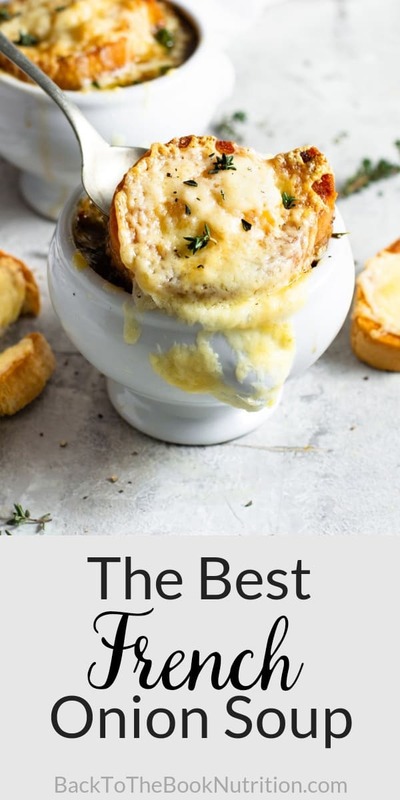 I just love french onion soup…this recipe looks amazing! I think I may have to get some of those oven safe bowls…they’re just too cute! Thanks! Oh wow! That looks perfect and incredible! Absolutely love this soup it’s so rich in flavour and tastes fantastic! French onion soup is the way to my heart. The toast looks perfect and the cheese melty and broth so rich and delicious! I just love that you used bone broth in this. It adds a great richness to the soup! And shallots too, what great flavor you have here! OH my gosh, this French onion soup looks breath taking. 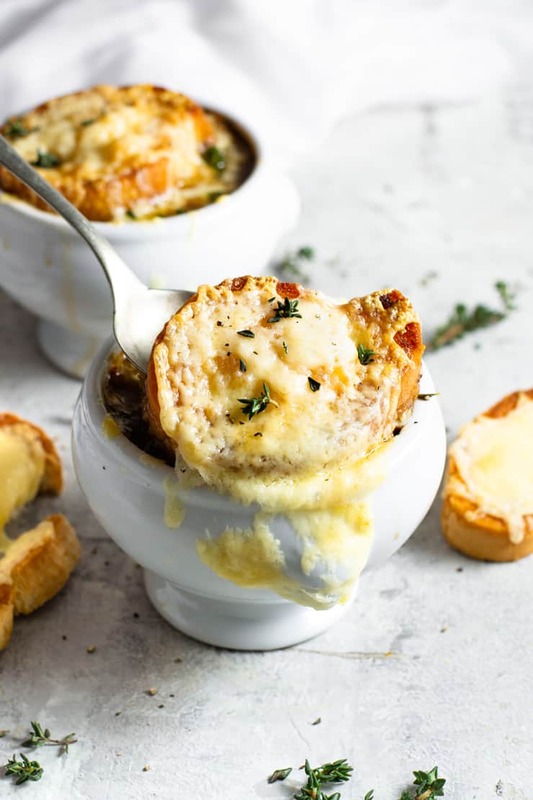 And that cheese….I just want a bowl of this rich flavored French onion soup right away! Looks so droolicious! I love French onion soup but I have not made it in ages. This looks so light and refreshing. Love how simple and easy it is too. I must make this for hubby and me. Yum, I am not surprised that your husband likes it as it looks fantastic! Love the bread on top with the melted cheese, what a nice touch. Cheers!! Oh yes, nothing can beat French Onion Soup during cold winter months. And that cheese topped baguette is absolutely irresistible. 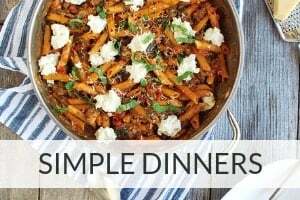 I agree – perfect winter comfort food! This looks like winter food at its best! I am drooling over those cheesy toasts on top and all the delicious flavours you added to the soup! Isn’t cheesy toast just the best?! I don’t know but really who doesn’t love french onion soup+plus OMGosh did you make it look so delicioussss! Want some now! The cheese looks out of this world yummy! I love french onion soup and always order it when we are out, but I think the time has come for me to try to make it at home! I recently had the most delicious French Onion Soup at a French Bistro and now it’s all I’m craving! So happy to see this recipe. Perfect! I love French Onion soup but have never made it from scratch like this. I like how easy this one is. 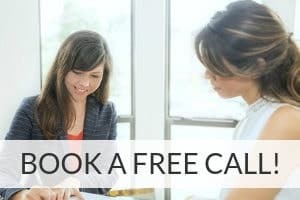 It really is simple – you should try it! This soup looks so yummy! I love french onion soup but I’ve never mde it before. Have to try this! This is my oldest son’s favorite soup. He orders it every time we go out to dinner. Well, I decided to surprise him using your recipe. He didn’t say a word. He was too busy eating his soup. After it was all gone – he said that was the best he’d ever had. So, this recipe is definitely a keeper!! Thank you. I LOVE French Onion Soup. I don’t make it often enough. Now I want it for dinner, This looks PERFECT…and all I need is a glass of wine and I would be a very happy girl. I’m going to make this one soon. I love onions especially when caramelized. Have not made French Onion Soup for so long. I think hubby and I would enjoy this very much. Thanks – hope you love the soup! French onion soup really is fantabulous and your version sounds wonderful. I like the idea of adding shallots too. That sounds like a fun challenge! I can be a little competitive with myself too so I totally get that feeling of wanting to make it the best. With that in mind, I’ll definitely have to try this because I LOVE French onion soup! 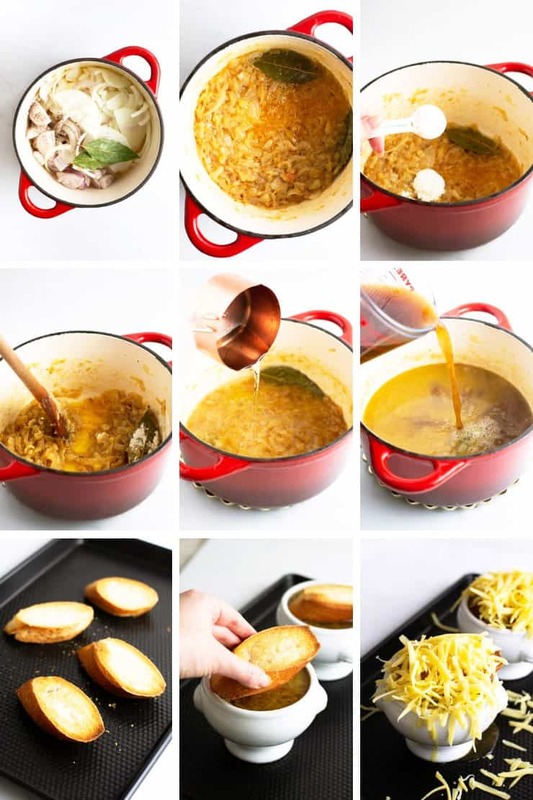 The images are a great proof – this DOES seem to be the best French onion soup recipe I have found to date! Yummy, delicious and so comforting! I have never had french onion soup. My husband loves it, I can’t wait to try your recipe. I have always been too intimidated to make it. Looking forward to trying this recipe. Plus the cheese on top is a great addition. It takes some time, but is really simple, Mirlene. I hope you and your husband love it! 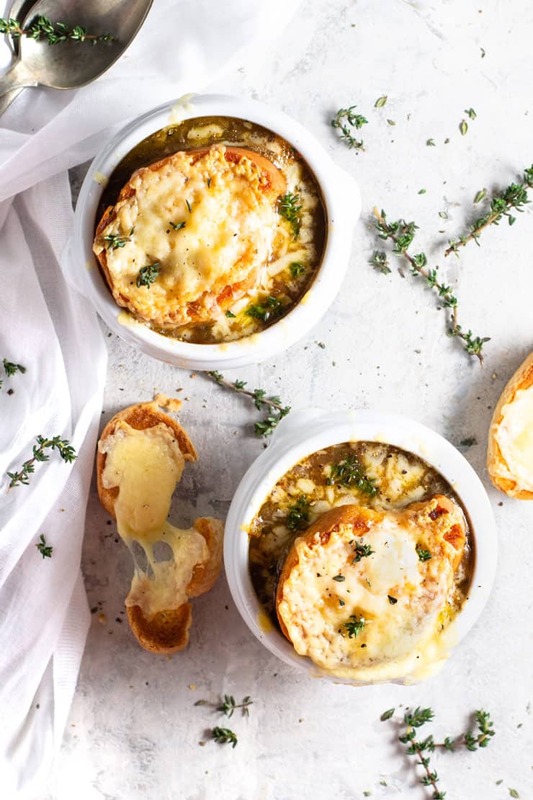 Your pictures really make this french onion soup stand out! Great work! Your step by step picture directions make this an easy to follow recipe as well. It is so funny that you posted this because I was seriously just talking with my husband about my recent cravings for French onion soup! I mean seriously, what is not to love?! You’re recipe looks very delicious and sounds easy too! Can’t wait to try! This soup sounds and looks amazing and I love how you photographed it, beautiful styling!